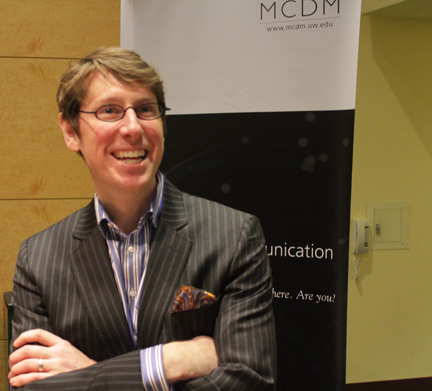 Students in Kraig Baker’s Digital Media Law course already appreciate his insistence that we understand the legal risks associated with new media and platforms. 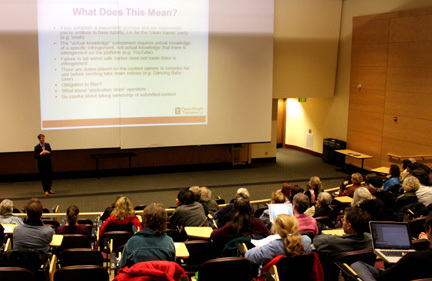 Understanding all the ramifications of taking these risks is “difficult under the best of circumstances,” Baker said during his SALu presentation Wednesday evening at UW’s Kane Hall. Whether a strong union successfully defends a woman’s right to rip her workplace in a Facebook post, or a woman loses her job for calling her friended-in boss “dumb” (Oops! ), there seems no real rhyme or reason to who or what is protected, and who or what is not. “Social media and digital media offer unparalleled access to creative tools, new art forms like mash-ups [and] almost frictionless distribution through social media platforms,” said Baker, but these same media “jumble” the many traditional legal approaches to media and technology. 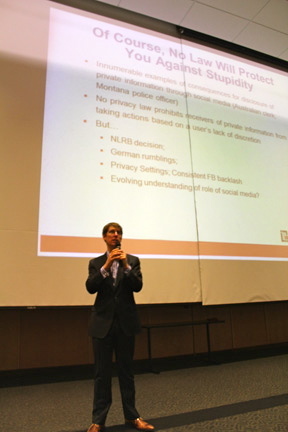 With the same style, timing and deadpan delivery of popular comedian Stephen Wright, Baker appears determined to show law for what he tells his students it is: “Just a word.” He relishes the challenge of clarifying basic legal structures “governing free expression, intellectual property and privacy” – ever evolving in this age of digital and social media. When it comes to free expression, even (and perhaps especially) celebrities like Kim Kardashian enjoy no free pass to libel another celebrity – even in only 140 characters of a tweet. But it is OK for Yelp! to host Joe next door to rain on the parade of a restaurant by tweeting how horrible their food tastes (but, of course, Joe next door is not off the hook). Intellectual (digital) property might just be the slope most slippery to navigate. Legend by now is Baker’s experience of meticulously sifting through decades of documents to untangle a Six Degrees of ‘Kevin Bacon-style’ web of Walt Disney, Star Trek genius Gene Roddenberry and, almost comically, Lucille Ball and Desi Arnez.